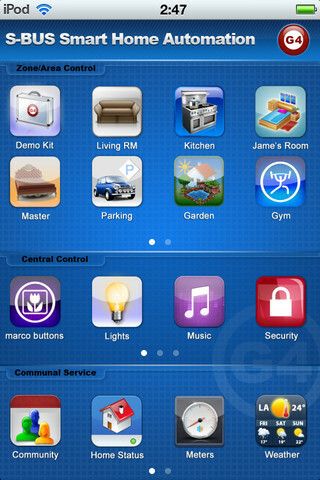 Working Application and Demo for Smart Home Automation Control App. Good for Smart-BUS G4 Enabled Installations that are Powered By (S-Cloud) only. This App. Enables the complete control of Lighting, Dimming, Moods, Scenes, Apple TV Video, Zone-Audio, Macros, HVAC Climate and Temperature, Shades, Drapes, and motorized Devices, Music and Distributed Audio, Security and Safety, appliances and Many More..